It is estimated that 2 million Americans self-harm, with the majority of this number being teenagers or young adults. However, people of all ages, gender, races, religions, sexual orientations, and socioeconomic statuses self-harm. Celebrities Angelina Jolie, Colin Ferrell and Demi Lovato have admitted to struggling with self-harm. Even Princess Diana admitted to intentionally cutting herself. The idea of inflicting injury on oneself in an attempt to feel better just doesn’t make sense. It’s a hard to explain, even harder to understand, coping mechanism. It’s a common misconception that people who self-harm are trying to commit suicide however, self-harm is not usually about wanting to die, it is about wanting to escape from the anxiety or negative feelings within, or a means to feeling “something” when their internal struggles have left them feeling numb. For many, self-harm is their way to express anger, sadness, grief or hurt. For some it is a way of communicating to someone that they need support or that they are not “invisible”. Nearly all self-injurers say that it provides for them a feeling of control when other things in their life are stressful, chaotic or simply out of their control. Becoming more knowledgeable and spreading awareness of Self-Harm is the best way to help those who are struggling. Here are some ways you can help to become part of the awareness movement. Share information on self-harm, emotional well-being and where to go for help. For someone dealing with self-harm, recognizing they are not alone and that non-judgmental support is available can be life-changing. Discuss appropriate ways to cope with stress and suggest ways that can make positive changes. Talk about cyber citizenship and bullying. The effects of bullying and exclusion can be tragic. People need to realize that jokes and harassing comments could lead to self-destructive behaviors. Encourage people to join the Self-Harm Awareness movement in their online communities and participate in the following activity. 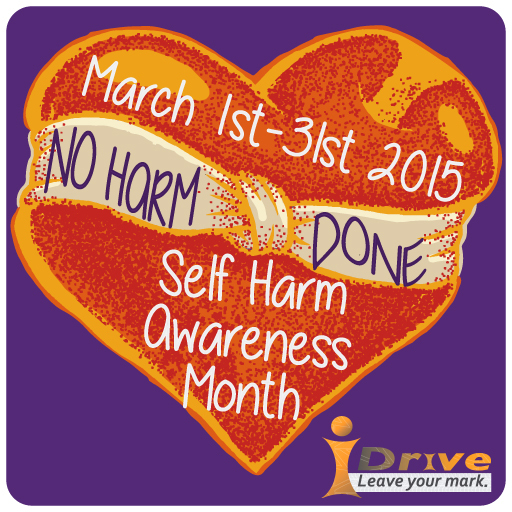 Join the Self-Harm Awareness movement! Download this image and share on Facebook and Instagram.